Just because injections have been unpleasent, patients have been rejecting dental visits and risking thier oral health. Our center have been using a computerized system, to provide local anesthesia in patients which help in reducing the pain and avoid discomfort in mouth significantly. Using a fine needle in a pen-shaped handpiece the anesthetic solution is provided. 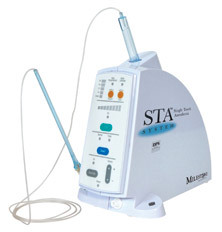 In order to control the pressure and flow rate, the computerized delivery system helps in providing comfortable injection. When providing with local anesthesia, the doctor would avoid the common stinging effect which is common with the traditional injections. This has been used in a wider patient base and we have been able to create a positive review for the common people. Oral health is very important in a persons well-being and so is needed at a dentist place to provide a pleasent experience for the patient.